Skunk Medicine, The Creature that leaves a lasting impression. If you don’t now, you will learn to respect me. Who hasn’t run up against a lesson from this amazing creature-teacher at one time or another? The smell of Skunk Medicine is something that one doesn’t soon forget. Skunk Medicine brings the lessons of Reputation , Respect, Sensitivity, and Confidence. When one learns to assert, without ego, what and who you are. Respect follows. Your self-respectful attitude will repel those who are not of like mind, and yet will attract those who choose the same pathway. 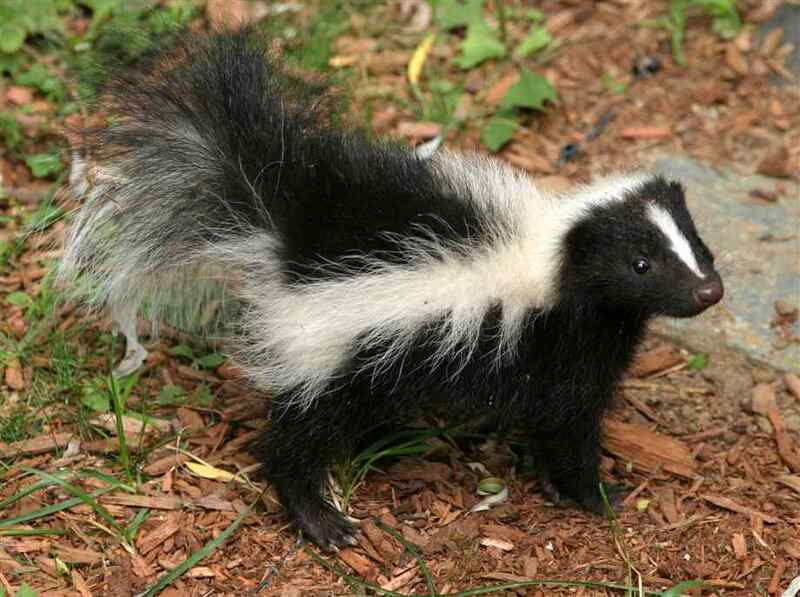 As the odor of Skunk attracts others of its kind, it repels those who will not respect its space. 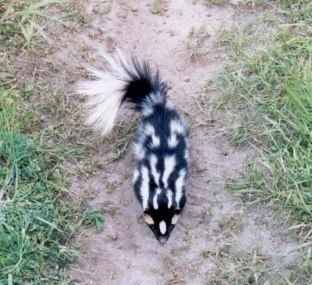 There are two main types of skunk, spotted and striped. The striped is the most common and most easily recognized. It actually has a double stripe that runs from its head to its tail. The stripe, whether single or double, is an sign of the active flow of the kundalini or life force. 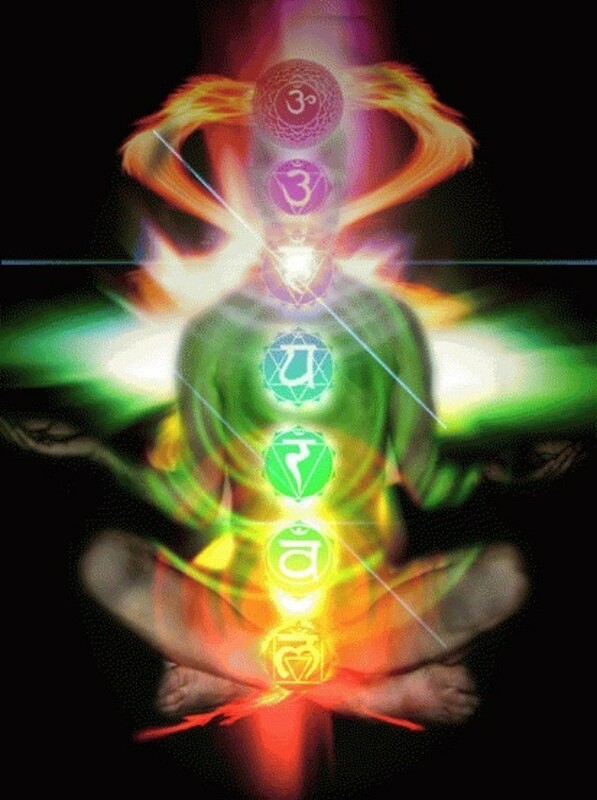 The kundalini has ties to the sexual energies and to the life force that is active in every aspect of our life processes. In individuals with this totem, the kundalini is usually already active. Skunk shows up at a time to amplify and to teach the control use of this life force more effectively. In eastern metaphysics, students are taught of three channels of energy that flow through the body along the spine, the ida, the pingala, and the sushumna. Respectively, the moon, sun, and the balance of the two. This reflects the ability of those with Skunk Medicine to be able to turn on and off the creative force and direct it along several lines. When Skunk crosses our path, we are presented with the perfect opportunity to become more confident in our interactions with others. Skunk spirit sets the perfect paradigm for meeting life challenges with a calm and peaceful stance. Skunk guides us to command respect from others, by first and foremost, respecting ourselves. Skunk Medicine wisdom teaches us to honor our spirituality as we spend time alone in silence. Helping one to build confidence in them self and to develop more strength of will and independence. Skunk Medicine people are not pretentious and feel compelled to be who they are without the need for approval of others to define them. Be who you are. Some of us stink at this. Skunk Medicine will help you develop trust in yourself (intuition) and to trust your instincts. Skunk has a reputation, presence, and strength most creatures of the animal kingdom respect. If not now, they soon learn their lesson. 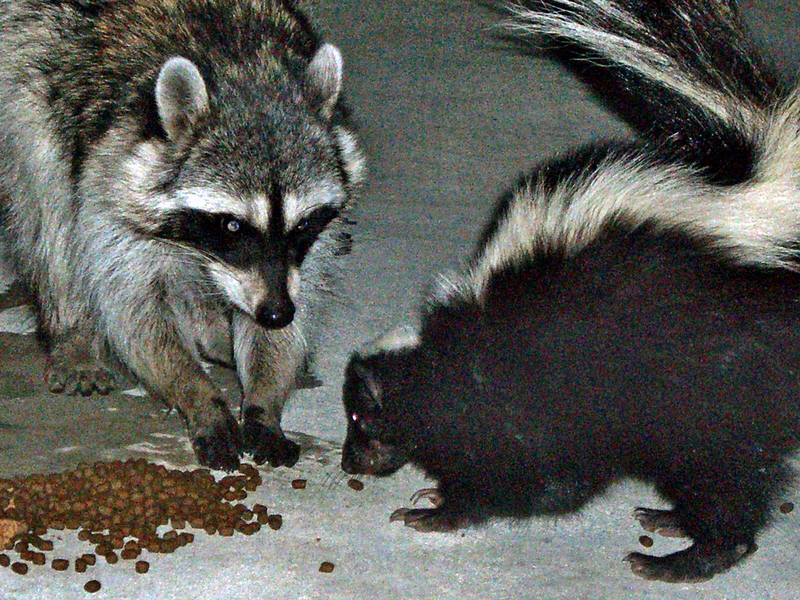 The skunk is a powerful small mammal about the size of a house cat. It is easily recognized by its long black fur and double white stripes, from its head, to the back of its legs and bushy tail. Skunk is a peaceful warrior, fearless and friendly. It appears nonchalant as it moves slowly but deliberately towards its goal. However, do not interfere with Skunk’s Medicine or you maybe left with a long-lasting impression of respect. Skunk has a distinctive behavior trait, which sets it apart from other animals. 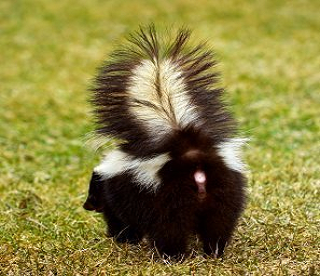 When skunk feels threatened it will turn its back on you, raise its tail and emit a smelly , irritating, chemical spray , which numbs the senses and stings the eyes. You will never forget an encounter with skunk. Skunk Medicine teaches you how to get respect without being overly aggressive or domineering. Skunk encourages you to raise a big “stink” if you are threatened, or being pushed around by a bully. Do not be afraid to speak up to defend your space. 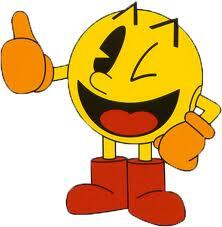 If you are being threatened in someway by somebody or something. Don’t worry about causing a ” Big Stink” when you expose these tyrants. Respect yourself and others will respect you. Be aware of your reputation. What is your self-image and how do people respond to you ? If you ” smell” something bad, make sure that it is not you, dumping negativity on others , or being dumped on. I am cute, but I command respect! Come on I dare you to get in my way! Skunk… smell me a story, so I will know it well, of how to attract and how to repel. Respect is the key, to be around me. I create a big stink, than give you a wink. Reputation in tack with white stripes on my back. When we meet again, will you be my friend? Skunk Medicine! Go ahead and laugh, you may even thinks this stinks. This furry little animal has a reputation that has a great deal of power. Due to its distinctive behavior, humans and other animals give this tiny, smelly, creature a wide berth. Unlike other predatory animals, Skunk does not threaten your life but threatens your senses. You know this to be true if you have ever been in the vicinity of its spray its powerful medicine. In observing the habit patterns of Skunk, it is easy to notice the playfulness and its nonchalant natural behavior. The “I-dare-you” attitude of this four-legged creature commands you, as the observer, to respect its space by mere reputation alone. Skunk Medicine is teaching you that by walking your talk and by respecting yourself, you will create a position of strength and honored reputation. The carriage of your body relates to others what you believe about yourself. There is no need to bully, aggravate, torment, or overpower other beings when your sense of “self” is intact. As with Skunk, the resonant field of energy around your body is relayed through the senses. Human Totality is living through all your senses. Self-esteem permeates the body’s energy, and is instantly recognized on an extra-sensory level by others. Skunk Medicine people also know how to use the energy flows that will attract a lover. 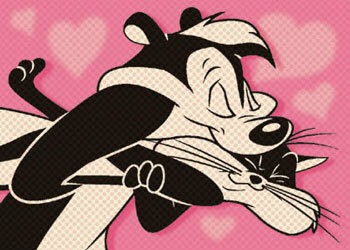 Remember Peppy Le Pew? Some people call this sexual magic, as it is akin to the musk scent that animals excrete to attract a mate. 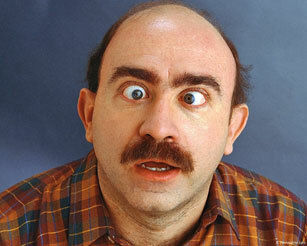 It can be dangerous to leak sexual energy if you are not looking for a mate. It puts you into a games condition that may feed your ego but not how others feel about you. If you are attracting others who have an interest in you, you are in a sense saying, “I’m available.” This can cause hard feelings when the truth comes out. It also leaks energy that you could have used in a more constructive way. The Skunk is a bad sign and a bad power. The sorcerers work with this power and send it as an ally against people to cause conflict, sickness, and bad luck. A skunk is usually a sign that evil is around you and that every effort should be made to pray against it. If you see or smell a skunk in a dream it is said to indicate some temporary disappointments or upsets forthcoming, but they should be short-lived. However, Skunk Medicine, is good to learn, allowing one to handle their energy flows. Modern psychologists call this body language. In tribal teachings, this is your personal medicine which you are showing to others. Use your medicine well, and know that you are known by your reputation. How you use your energy will attract either honor or disgrace. You may want to examine what energy you are putting out that creates your present situation. This symbol, is asking you to notice the kinds of people who are attracted to you. If they emulate favorable characteristics, have enough self-esteem to recognize those characteristics within yourself. Walk tall and be proud of the accomplishments you have made. Bear in mind that what you believe about yourself is your greatest protection. I can do this all day! Get out of my way. Meaning the abuse or misuse of this Medicine and the big stink it causes. Skunk Medicine operating through the contrary or reversed position indicates that your self-esteem may seem to others as if you are putting on airs. Observe whether you are repelling others in your vicinity because of envy, jealousy, or a projection of their low self-esteem. Examine your feelings. Be truthful with yourself. Right the situation by assuming the attitude of Skunk: nonchalance. In assuming nonchalance you are neutralizing the effect of leaking energy. In leaking vital energy, you may be stinking up your environment. This is similar to dumping all your woes on anyone who will listen. If you are doing this, it may be time to shut your mouth and go within. You may also be leaking sexual energy and repulsing the object of your interest. That person may be too shy to tell you to lay off. Look deeply at your self-image and how others are reacting to it. To balance the causes and effects of your actions and energy flows, you must decide whether you need to spray in the direction of others to repel their envy, greed, jealousy, or over-amorous tendencies. You need to always maintain your “right to be.” Self-respect is the key to all of these situations, whereas ego is merely what you believe yourself to be. It’s nice to have a friend to share a meal with. Again, If your ego is not your amigo, you know it stinks! Ego is one of the first things we need to bring under our control when we’re learning to walk a spiritual path. There’s just no room for it there and it is a mask for what we want to accomplish, not what we have accomplished. Raccoon Medicine may better serve you here as they are the masters of wearing masks. The skunk walks tall and proud with the knowledge that even though small, he has a power of protection within him. This symbol is reminding you, “Walk tall. There is a strength available within you that will protect you and keep you safe.” For courage and will-power to raise a “stink” if you are being harassed or threatened. Radiating self-respect and self-confidence. Become aware of the type of people attracted to you and repel the undesirable. Sifting out and getting rid of “friends” who do not want you to succeed. Self-assertion and confidence. 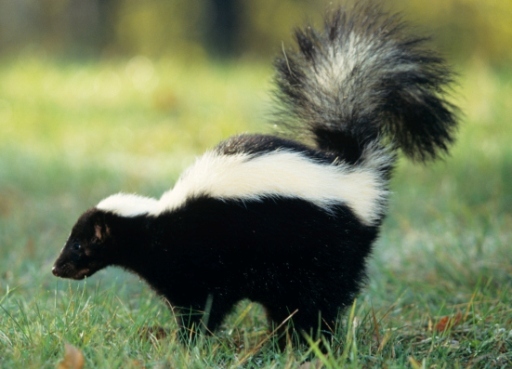 The skunk’s scent is a protective odor, but it is uniquely its own. Getting the respect one is due. Skunks do not like confrontation, and usually withhold their spray until no other option is left. Have you been holding back in some area where recognition of your abilities is long overdue? Irritating people or situations. Being sprayed by a skunk causes all kinds of distress, most of which stems from frustration about being in the wrong place at the wrong time! Ordinarily, skunks are peaceful, friendly creatures. They are slow and deliberate in their movements. 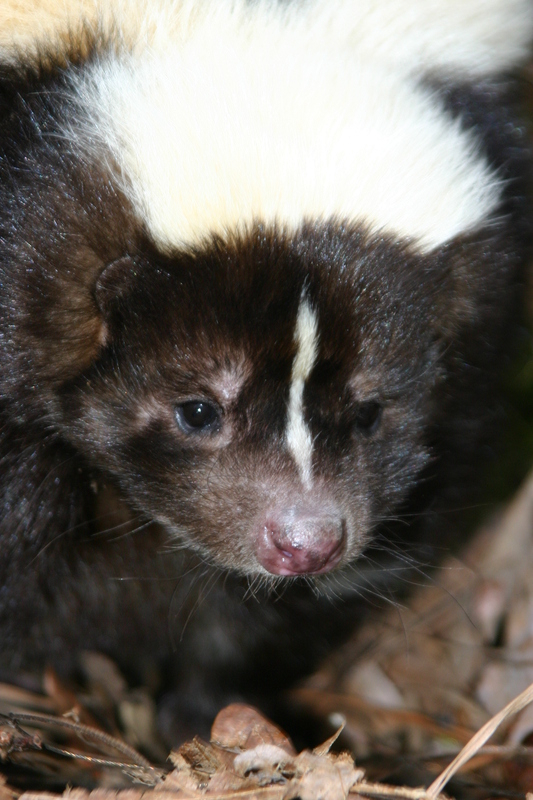 When menaced, however, the skunk can emit a nasty spray that can be smelled for half a mile. 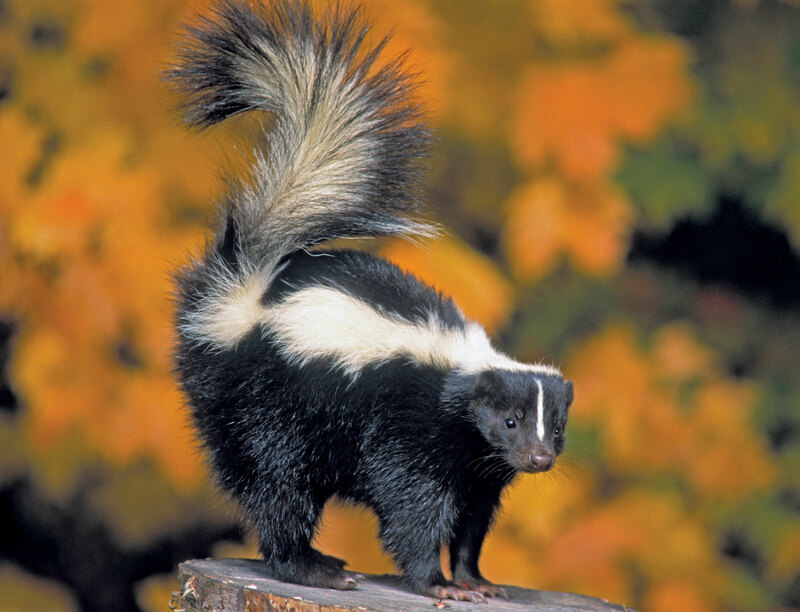 The idea that skunk sprays its odor on its tail and then flips the droplets at the aggressor. Is simply not true; when that back-end faces you the tail raised, watch out! The glands at the root of the tail have strong squirting power. The skunk is one of the most widely recognized mammals, but it is also one of the most misunderstood. Skunks are fearless, but they are also very peaceful. It is a very powerful totem with mystical and magical associations. Just look at how people respond to it. They show great respect for it and what it can do. This is part of what skunk teaches. It teaches how to give respect, expect respect, and demand respect. It helps you to recognize your own qualities and to assert them. The skunk does not get out-of-the-way of any animal. It moves along at its own speed, with its own mind. It is self-assured and confident in itself. It can teach you how to be more self-assured and how to assert yourself. Because Skunks are peaceful by nature, they always give warnings before spraying. This warning involves three stages. First, it will stamp its feet and turn its back to you. Second it will raise its tail up, as the gland which sprays is located underneath it. When the third step arrives, it is usually too late. After raising the tail, the skunk will look back over its shoulder. This is to line up the correct angle for spraying. Once the skunk has seen you over its shoulder, it is too late. The skunk can spray 12-15 feet with tremendous accuracy. It can repeat the spraying five to six times before it must build up again naturally. The spray is an irritating oil chemical. It won’t kill, but it can sting the eyes causing temporary blindness and numb the senses. Tomato juice is still the one thing which helps to eliminate skunk odor. The qualities and characteristics of the tomato should be studied as it is part of the contrary or balancing Skunk Medicine associated with the skunk. Skunks are usually quite silent, so it is good for those with this totem NOT to blow their own horns. It will back fire and only serve to push others away. Sit back and let others do the noticing for you. Skunks are very adaptable and this is what those with this totem must also learn. Skunk can teach you when it is best to be noticed and how to go about it most effectively. The skunk smell is one that almost everyone can recognize. This links to how skunk awakens in others a great recognition of you and your own abilities. The sense of smell also has ties to sensuality and sexuality. 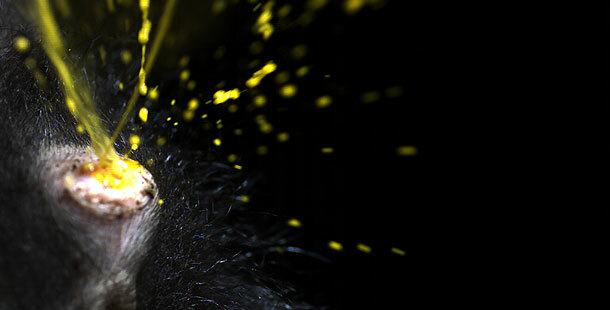 Research is being conducted that reveals the various connections between fragrance and sexual response. This includes work with pheromones and studies show a surprising similarity between the cells of and response of the olfactory nerves, and those within the genitalia. Fragrance has long been used as an aphrodisiac. Those with skunk medicine will find that the use of fragrances will elicit dynamic responses in those they associate with. People will respond to the fragrances you employ. A study of aroma-therapy would be very beneficial for those with this totem. When skunk shows up, you can usually expect to experience stronger sexual responses to others and in their response to you. A greater ability to attract people will begin to unfold. It is interesting how people respond to some fragrances. They complain that certain smells drive them nuts. Skunk Medicine teaches us to understand a warning. Our instinct often foretells trouble ahead, but often our mind gets in the way and gets in the way of this knowledge. There is much wisdom to be gleaned from skunk. You can learn how to honor the part of yourself, which like the skunk, gives you many warnings before an actual problem or disaster develops. If skunk appears in your life, it could well be your intuition sending you a signal of imminent danger or caution. Skunks do their thing quietly. Skunk does its hunting at night. This is the power of this animal totem, you are advised to do the same. Unbalanced skunk people have a habit of blowing their own trumpet, looking for recognition. 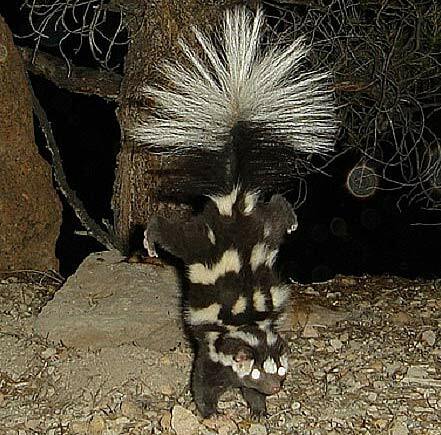 As skunk possesses intense energy, this can create problems in communicating with others. Those with Skunk Medicine are either well liked or disliked. The art of attracting and repelling are natural skills, and very beneficial when mastered effectively. Remember this, people notice you all the time, but how they notice you can be controlled by you. We would all do well to take this animal symbolism from the skunk: Do no harm. Indeed, as a totem animal, the skunk asks us to defend ourselves effectively, without causing further conflict or harm. Skunk Medicine may smell a little. But you catch my drift. Skunk Medicine leaves a lasting impression, of respect. at Yahoo’s front page and see how they create news titles to grab people to open the links. I just had an interesting encounter with a skunk. I’d been having a difficult time and was on a journey to a new job in a new place. Two nights before I met the skunk, my best friend and I barely escaped with our lives from her house on fire. I was incredibly stressed and went up to this place in New Mexico, Elephant Butte. I rented a cabin, and was essentially alone and it was peaceful; just what I needed. In the middle of the night, I sat out on the steps, just looking at the stars. I heard a critter coming, looked, and saw a very large skunk, very large white stripe. I just sat still. He walked right up to me and sat at my feet. His hairs were brushing my toes. I did not move at all. After about a minute, he looked at me, got up and turned to walk back the way he’d come. I really wonder what this was about. Thank You for you comment, and sharing your vision. Not sure, are you asking, what this vision means from my point of view? I have got look over massive amount of information sites plus completed many websites,your work is truly wonderful.Hats off for your perseverance together with credibility.Do maintain us all educated at a later date too.